[Image: The cooling towers of the Ferrybridge power station; photo by Eric de Mare]. The above photo has really stuck with me since seeing it last week over at Millennium People—not only its juxtaposition of architectural types (the narrative ornamentalism of a small English church almost literally overshadowed by the minimalist hyper-functionalism of the cooling towers) but the photo's implied collision of material activities (prayer, say, vs. the illuminative processing of rare fuels). I might even suggest that it presents us with some strange, nuclear-Anglican revision of what Manfredo Tafuri would call the sphere and the labyrinth—that is, the altarpiece meets the reactor core—but the station is actually coal-powered, not nuclear at all. The image is nonetheless quite stimulating. Imagine disused cooling towers repurposed as a church—or a library—or Chartres Cathedral put to work as a nuclear power station, its filigrees of saints and masonry trembling as atoms split and machines spin wildly in the basement. Plenty of latitude for corollaries, similitudes, analogies and metaphors here. Both structures deal with the hidden and the powerful, edificee representing central tenets around which lives are/were organised. I remember watching an interview with Terry Gilliam when he was talking about shooting a scene of Brazil inside a cooling tower. He described it as a religious space, because from the inside it has this intense focus on looking skyward, (kiind of like a really large scale version of a Turrel sky-viewing room). Are you sure that is a nuclear plant? I actually believe that it may be a fossil plant - with what Americans tend to recognize as "nuclear" cooling towers. Regardless, a fantastic photo. So check this out: What if we took those hyper-minimalist cooling towers and fitted them with (maybe even 3d printed) ornamental fins to help with radiative cooling (a la a car radiator) and make them look beautiful as a byproduct? The satellite image reveals the church and many other churches are indeed around the cooling towers. The Brotherton church, in the photo, is about 400m from the cooling towers. However the photo is proven fake. When looking at the church and imagining an axis through bell tower and symetricaly through the church their should be no cooling towers to the right of this axis. So the situation does exist of cooling towers in the landscape behind the church, but they are not the curved towers of this picture nor are they abel to overshadow the church at 400m away. Will, it's worth bearing in mind that another power station used to stand on the site—Ferrybridge B—but it was completely demolished, and also that 3 out of 8 of the original cooling towers of Ferrybridge C collapsed in 1965. So while the photo might be "fake," it might also be documenting cooling towers that no longer exist. 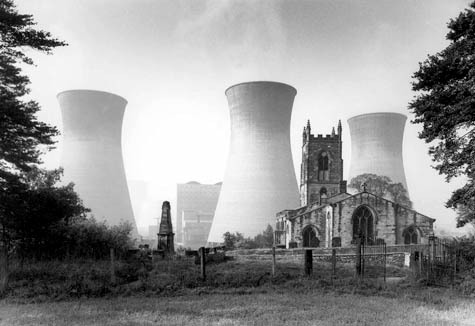 Running Tineye on the photo turned up Media Storehouse's page, which actually refers it back to the English Heritage catalogue, with the caption "View of the 19th century church of St Edward's in the foreground, dwarfed by the cooling towers of Ferrybridge 'B' power station. Date range 1960 - 1980. Eric de Mare.". And here it is on Viewfinder, their own archive site (without a watermark and with a nice enlargement, although John Davies (as referenced on Millennium People) has an even larger copy).